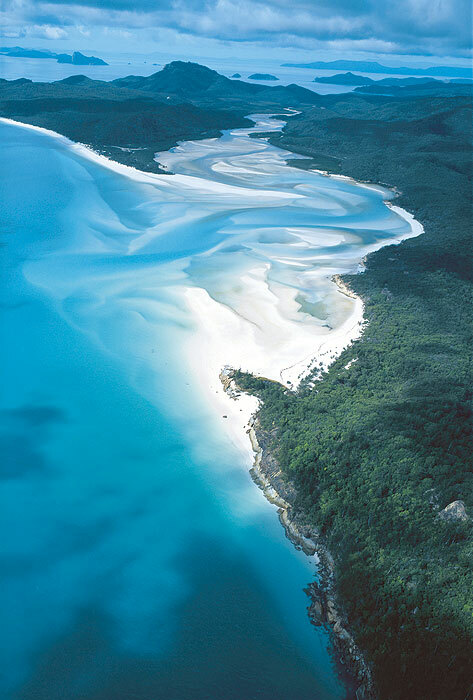 Whitsunday Island is the home to one of Australia’s (and the worlds) most recognisable beaches. Whitehaven Beach. Somewhat of a media tart that hogs the tourism spotlight with regular red carpet appearances at “Best Beaches” awards nights, the Whitsundays’ poster child is famous Whitehaven Beach. Surely the most photographed beach in Australia, Whitehaven doesn’t disappoint once you experience the powder soft sand oozing up between your toes. Hill Inlet at the northern end is a remarkable maze of dazzling sandbars broken up by sparkling tidal pools. The walk from unimaginatively named Lookout Beach up to the viewing platform is a staple for taking your own photo of this Whitsunday icon. Heavily forested Whitsunday Island is the largest of the islands, and has plenty of other attractions once you’ve swum in the gin-clear water and cleaned your diamond jewellery in the talcum-like sand. Gulnare Inlet could double as a fjord; popular with locals, it doesn’t attract the bareboat fleet. It’s also home to some Hamilton Island workers who anchor their vessels here and commute to Hamilton by dinghy. Cid Harbour is well entrenched on the charter boat itinerary; deservedly so, since it’s a safe, picturesque, all-weather anchorage. It’s also very social, with regular sundowner gatherings on Sawmill Beach. If you’re looking for a little solitude, you’ll find it by taking the walking track through the forest and over the ridge to Dugong Beach. Campers are well catered for, with eight campsites on Whitsunday Island and a further three on neighbouring Cid and Henning. Getting There: Boat charters depart from Hamilton Island, Shute Harbour and Abel Pt Marina for Whitsunday Island attractions. Seaplanes and helicopters depart from Hamilton Island and Whitsunday Airports.